Videos: What's in the Bible? Bible Story: What is the Bible? Objective: The Bible is God's Holy Word to help us know more about Him and how to live. Verse: II Timothy 3:16 (NIV) - All Scripture is God-breathed and is useful for teaching, rebuking, correcting and training in righteousness. ...is true, trustworthy, forever, and does not fail. ...contains 66 books. God used more than 40 men to write His message. ...is a very long letter written to us by God through men. It is exactly what God wanted written. He directed the men to write His message using their own words. ...shows us how to live in ways that make God happy. ...teaches us about God the Father, Jesus, and the Holy Spirit so that we know who God is. ...proves that Jesus is God's Son and shows us how we can be saved by believing in Jesus. ...teaches us how to love God and others and will help keep us from sin. ...is to be memorized and studied so that our minds are filled with God's Word. "Jesus is the most important Person in the entire Word of God. He is the central figure of the whole Book. Before He was born, people looked for His coming. Today we look back at the cross, where He paid for our sins, and we also look forward to the time when all who are saved will be with Him forever (John 3:16; I Thes 4:16,17)." - The "What's in the Bible?" DVDs are fantastic to explain what the Bible is and what each book of the Bible contains. "What’s in the Bible? is a DVD series from VeggieTales® creator Phil Vischer designed to walk kids and families through the entire Bible." 13 DVDs cover Genesis to Revelations. - II Timothy 3:16 (NIV) - All Scripture is God-breathed and is useful for teaching, rebuking, correcting and training in righteousness. Ask the child to think of a promise from God. As a hint, tell the child "Noah's Ark." The rainbow was one of God's promises to His people to never again destroy all living creatures by a flood (Genesis 8:21). But this is just one of thousands of God's promises given to us in the Bible. Using the idea of the rainbow as a promise from God, hang clouds with Bible verses declaring other promises. The God's Promises worksheet is available with possible verses or create your own. Directions: Paint or color the Rainbow worksheet. Cut out the template and glue onto cardboard to make it sturdy. Punch holes into the base of the rainbow and tie different length strings. Cut out the clouds and punch holes in the top of each. Tie to the end of the strings on the rainbow. Glue cotton balls at the base of the rainbow to cover up the holes and string knots. Hang this craft in your child's room and pray these scripture promises with them each night. Introduce addition by creating a small group. Ask the child how many are in the group when one is added. Tie a string on a pine cone to hang it in a tree. Cover the pine cone in smooth peanut butter. Roll the pine cone in birdseed. Hang in a tree for the birds to eat. - Bird Nest Cookies - These cookies are so yummy and kids can easily make them without too much help! with liberty and justice, for all." Stand in attention to the flag. Salute or place your right hand over your heart. 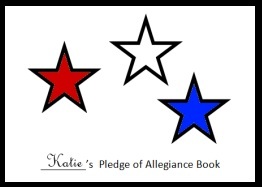 - My Pledge of Allegiance Book - Create a Pledge of Allegiance book with pictures defining the pledge. Staple together five small sheets of paper to form a book. Cut apart the Pledge of Allegiance worksheet and color each box. Glue one box per page in the book in the correct order. In the second box, for “I,” have the child draw a picture of herself. - Learn the Pledge of Allegiance in Sign Language with this YouTube video. 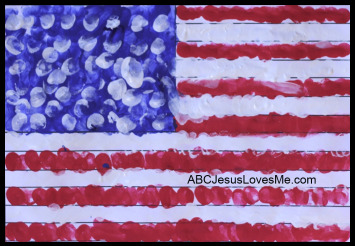 Paint the Flag worksheet using fingerprints. Paint the blue rectangle first to allow it to dry before adding the 50 "stars." Place paint on a plate and dab three fingers into the paint. Stamp the fingers on the flag. Use one fingerprint to create the stars. Count the stars as you paint to get exactly 50 stars. Use the Kk Writing worksheet and for further learning check out the Letter K Activities. Place 35 dots of paint on a piece of paper. Point to and count from 0-35. Make sure that each item is pointed to and counted only once. The medium is what the illustrator uses to create the illustrations in a book. Some medium choices are crayon, colored pencil, water color, paint, pencil, charcoal, chalk, and oil pastels. The different media that the illustrator chooses will depend on the overall look that he or she is wanting for the book. Harold and the Purple Crayon is the perfect example for introducing illustrations and medium. Harold feels a raindrop hit his head. What can Harold draw? Harold feels sad. What can Harold draw to make him feel happy? Harold is hungry. What can Harold draw? Hide coins or small items in play dough or putty and have your child find the item. Encourage your child to not use her thumb but to use the weaker fingers instead. Walk like an animal - have the kids come up with ideas but here are a few to get you started. While cutting worksheets are not typical visual perception activities, these Cutting worksheets are included as children with visual perception issues often struggle with cutting skills. Teach the child to cut in the middle of the black line. Dominant hand does the cutting while the other hand moves the paper. Elbows should not point out while cutting. If this happens, the paper needs to be moved. 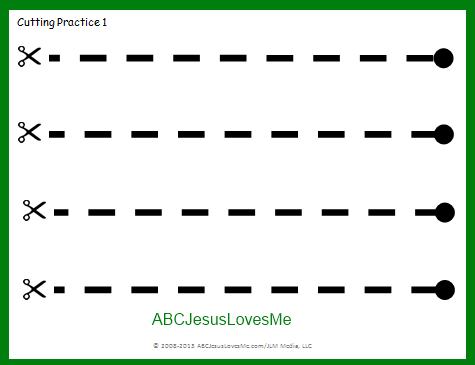 Additional worksheets available in the ABCJLM Visual Perception Workbook.